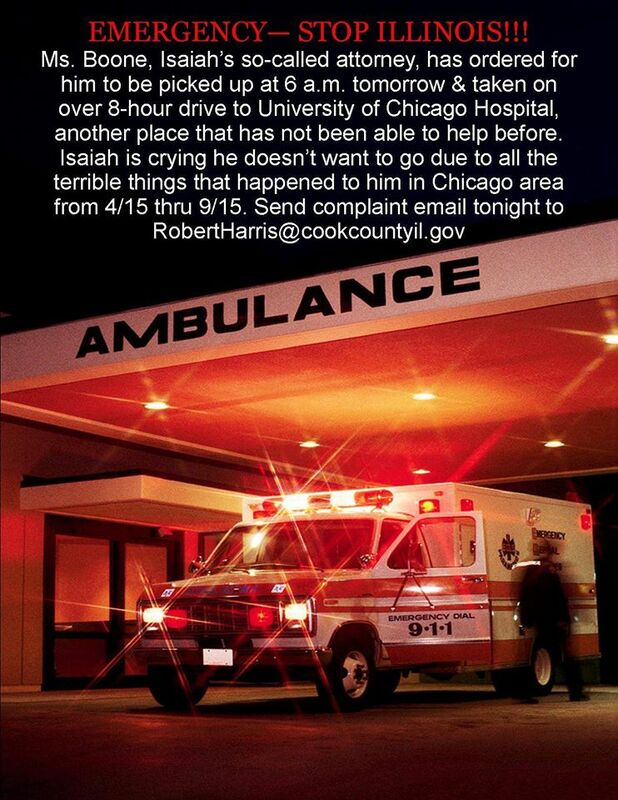 Health Impact News has just learned that Team Isaiah Facebook Page is reporting that the State of Illinois is transporting Isaiah Rider back to Chicago from Kansas City against his wish and the wish of his family on December 5th. All of this has already been done. Who gets billed for all the medical expenditures in a case like this? Someone needs to help this kid. He is 17 years old. Almost an adult. He should be able to make his own decisions on when and where he wants medical treatment. Maybe a lawyer out there would be willing to help fight for this kid rather than the one that works for the system he is caught in. So sad! This is a crime! Let the boy have a say! He is old enough and intelligent enough to speak up. As far as parental rights... this whole case is a travesty. The government, hospitals, and doctors do NOT own our children! This totally disgusts me!! Why does the government pick on the people doing what's right why don't they go after people that don't care about their children, like the people who are killing their kids etc! For God's sake leave this family alone!!!!! It is just disgusting that this can happen here in the United States. Isaiah's rights are being violated. He needs immediate medical attention from the specialists at Cincinnati Children's hospital. Isaiah is in unbearable pain. His medical condition needs to be treated by specialists who understand his conditions. Why is Kimberly Boone not allowing him to go to the hospital that can help him and is willing to take on his care? Is this how Kimberly Boone would want her son/daughter treated? This is wrong on so many different levels. Michelle Rider is advocating for the best possible care for her son, Isaiah, since when does that become a crime and medical child abuse? This is terrible. This boy is a resident of Missouri. How is this not illegal. They have proved they can't help him. Thru are just hurting him more. Poor Isaiah, I pray for you every night. I have followed this story for months. I made phone calls to people at DCSF in IL. No one in IL cares about this boy. They only care about having control of him. I think it is unconscionable that this can happen in the United States!! !